Metal Roofing DE is the area’s leading residential metal roof installer. We take pride in the beauty of your home and help you achieve the curb appeal you desire. We offer 100% satisfaction and stand behind all of our craftsmanship with labor warranties. 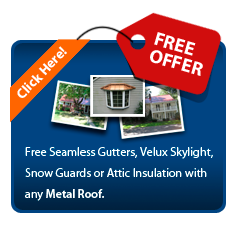 Let Metal Roofing DE make your home the most beautiful house on the block with a metal roof. Our company is staffed with friendly faces that are eager to help you with your upcoming roofing project. We operate out of a 16,000 sq ft building where we store the vans, trucks, and equipment necessary to make your home as beautiful as possible.